London-based tailoring brand Kit Blake draws on the heritage of Savile Row to create separates that are decidedly modern. 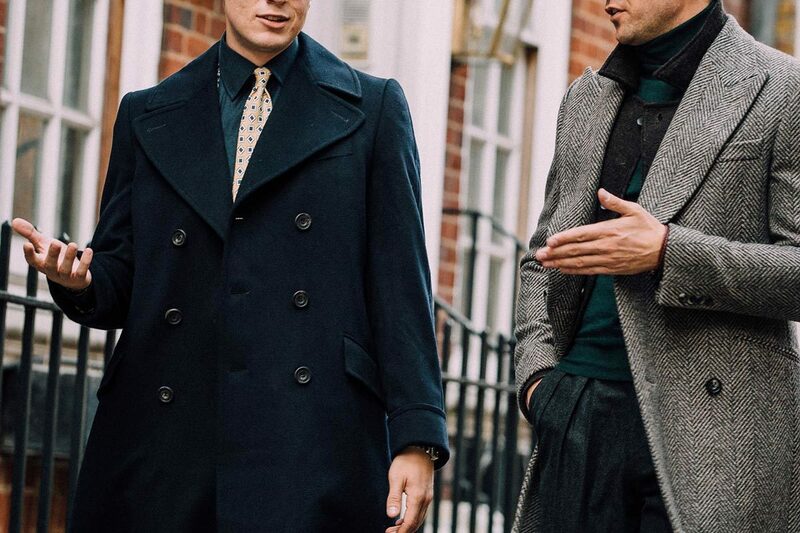 The Kit Blake navy wool overcoat, made with Loro Piana wool, and charcoal pleated trousers. Photograph by Jamie Ferguson. Kit, an abbreviation of Modoo’s first name, and Blake, the street he grew up on, was Chris’ alias while he was working on the Row. Decades later, it’s the name stitched into the designs of his own menswear label, as a hark back to his time working on the world’s most famous tailoring street. Like many of the people who reside in the sartorial realm, Chris is deeply passionate about menswear, and has seemingly always been that way. His first job was at Selfridges, working in the tie department, where he waxed lyrical about tipping, knots and blades, and where his love for menswear flourished. “I absolutely loved it, I was just like a sponge,” says Modoo. From there, he went to Jermyn Street shirtmakers Thomas Pink, and then on to 40 Savile Row, which specialises in made-to-measure suits and where he learnt about fabric, fit and styling. He then moved to Ede & Ravenscroft to head up the house’s made-to-measure department, before moving to Chester Barrie in 2011, where he designed the house’s collections until 2017. To complement the trousers, Kit Blake also offers a selection of jackets, a waistcoat and an overcoat, which are all made in Puglia. This includes a double-breasted, low-buttoning jacket, crafted from Fox Brothers flannel and made exclusively for The Rake. “It’s essentially a traditional British jacket, with quite a firm but natural shoulder line, plenty of rope at the sleeve head and generous lapels.” The navy overcoat, which the designer describes as “pure Chris Modoo”, is unapologetically over-the-top, made with Loro Piana wool and featuring a generous stand-up collar, back pleat and oversized horn buttons. These pieces are designed to be worn as separates, which is another key part of Modoo’s vision, and perhaps contradicts his time working on Savile Row. “I’ve always liked mixing my suits up, I’ve always liked separates and I think it’s just a more practical way to dress,” says Modoo. “I’ve always had a problem with the fixed suit. Unless there’s a specific reason, I think a jacket and trousers with a shirt and tie is a more contemporary way of dressing.” Indeed, Modoo is making a convincing case for a wardrobe comprised of well-designed and well-executed pieces, that can be worn in a multitude of ways. And although his designs draw on the best of London's tailoring heritage, they're presented in a way that's decidedly modern.